This is a precious book about construction sites. This book would be very good for younger readers around 1st grade and under. I think that this book would be a good book for nap time stories in pre-k. 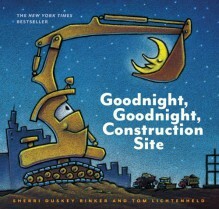 Cute book about the construction vehicles as they end their work day and go to sleep. The illustrations are wonderful. Look closely at them for more fun. A delightful book! A bedtime story for truck-loving toddlers.